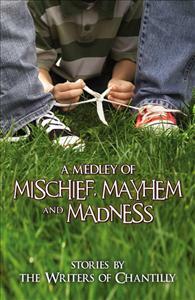 A MEDLEY OF MISCHIEF, MAYHEM, AND MADNESS captures the essence and diversity of mischief. From innocent to malicious, their stories will keep you guessing . . . and laughing. The talented Writers of Chantilly bring us another medley of stories, this time themed around “mischief.” The authors offer a stellar collection of exciting and funny short stories and poems that range from innocent to malicious. Whether stories of office pranks, childhood hi-jinks, or just humorous observations of life, this anthology aptly captures the essence and diversity of its subject. You’ll experience each fantasy, every memory, and all the circumstances attributed to mischief. Each page will keep you guessing—and laughing—as you realize just how wonderfully silly and sometimes serious “mischief” can be.